Posted: Wed 28 Dec, 2005 7:36 pm Post subject: Myth of the "pointless celtic sword"
"Conventional wisdom" also states that the late period or La Tene III swords are spatulate pointed---long, broad, but not suitable for thrusting. Looking through journals and reports from many sites and many regions, I see some of these swords, but many, many that have points. Some of the swords that are rusted into round-ended scabbards may very well exhibit sharp points. Posted: Mon 23 Jan, 2006 12:47 am Post subject: celtic scabbard construction? Does somebody have more information on LaTene scabbard construction? I mean specially iron scabbards. I am happy for any hints how the sheet metal is fixed together and how the chape/crest is made. I heard of a new book coming out by I.M. Stead, "British Iron Age Swords and Scabbards." It's due to come out in March 2006 with an introductory price of GB £50.00. At least that might help with British designs of the period. I haven't seen it to know if it's of any value though. Otherwise consult Gournay III: Les Fourreaux d'Epée by Thierry Lejars. I ordered the book, the French one. It arrived last week. Great! Thanks alot for that hint! Hi everyone , this is my first post on myArmoury and I’d like to introduce myself. My names Steve and I live Gloucestershire, England. I have read many of your posts and I am quite amazed at the amount of knowledge you possess on your various subjects. The reason I have joined your forum, is to share with you some of the unique objects I have uncovered in recent years , some which have been of national importance and are now on display in various museums. These items have been unearthed by myself, In the pursuit of uncovering the past with the aid of a metal detector. Many of these items would have lain undiscovered for eternity or destroyed by modern farming methods if they hadn‘t have been recovered by this method. Most of my finds have been recovered from the plough soil, and have been moved many meters from there original position ,so they have been found in isolation and are probably just casual losses. My objective is not to hoard objects and hide them away in private collections but to share my knowledge with like minded people, as I believe history belongs to all of us. 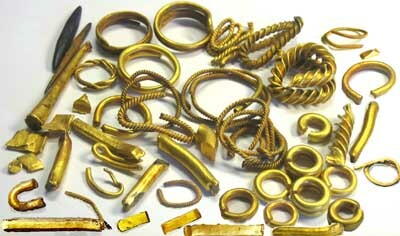 In 2003 whilst detecting on a large field in Gloucestershire I was fortunate to uncovered a large Bronze Age gold jewellery hoard,. 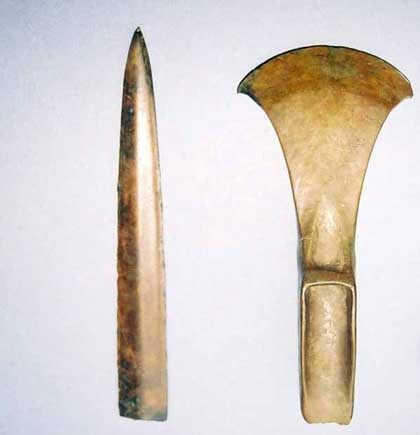 This hoard contained 54 items of gold along with a bronze knife, which has been dated to between 1200-1400 BC. It is now on display at the Corinium museum in Cirencester, and has since been called the Poulton Hoard after the area in which it was discovered.. But a more recent find is a bronze anthropomorphic sword pommel measuring 34mm x 22mm. This object is quite spectacular as it shows the amazing workmanship and skill of Celtic craftsmen and is probably one of the best examples ever found in Britain. The sword pommel from a La Tene III anthropoid sword hilt is in the form of a male head. The head has an elaborate hairstyle of five braids emanating from knobbed terminals at the forehead. 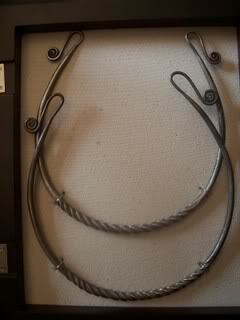 The central braid is perforated near the top of the head for the end of the tang of the iron blade. The oval face has high arched eyebrows, lentoid eyes with eyelids indicated, a flat nose that joins the eyebrows, large ears and a wide moustache above a slit mouth. 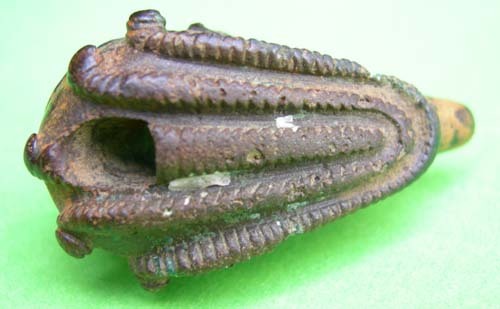 The bottom of the object has two triangular forked prongs projecting approximately 10mm from the head and forming a neck. No other Celtic objects have turned up in the area so it had probably come loose and fallen off when in use. Wow, an amazing pommel Steve, the hairstyle is quite something different, more reminiscent of our new age travellers. The museum where i live (Hull) has some good 'celtic' swords and chariot burial artifacts but these are well known, in a couple of months a hoard of I believe five 'celtic' swords (you may probably know of them if your in the detector circle) will be put on display in Beverley, a couple of friends and myself have been asked to go along for the promo to represent 'celt' warriors. If I get the opportunity I'll see what further info, images I can get at that time to share on the forum. Welcome to the forum and thanks for sharing these finds with us! 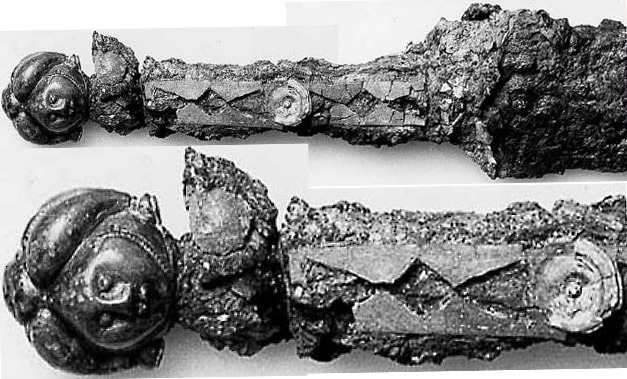 Even in fragments Celtic swords can be amazing works of art. What is intriguing to me is that the pommel has the beautiful curves of Celtic forms. However, the grip is decorated with geometric forms more typical of earlier times. 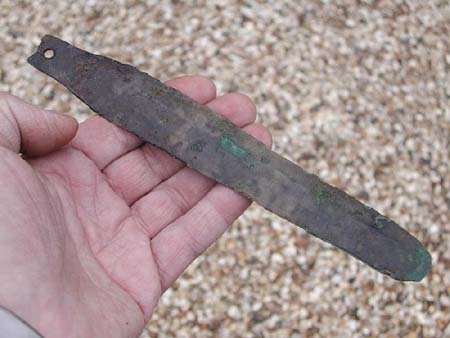 Thanks everyone for your comments, here is a picture of my Bronze Age knife which was found near to the gold hoard, and in the adjacent field, my friend unearthed a fantastic axe head and rapier blade. I have attached pictures of another Celtic pommel that I bought from a dealer in Suffolk. No provenance, unfortunately, but given the similarity to the pommel from Norfolk, I would guess Iceni. ca. 50 B.C. - 50 A.D. H. 25mm -- W. 12mm D. 19 mm. On both sides is a shallow concave channel where the "arms" would have fit. A hole is bored into the head above the left channel, presumably to fit a securing peg from the "arm". The base has a 6 mm deep hole. There is a 2mm deep concave channel that runs from side to side cut into the base and a 1mm deep concave channel that runs at a slightly off-set right angle to it. The overall appearance is of the head of a Philips screw with a hole at the centre. I suppose that the mechanical arrangement was to prevent the accidental loss of the pommel by making sure that it would not move in its mount. I apologize if I missed anything in this long thread, but something relevant here is that some historians, linguists, and geneticists are beginning to reject the idea that the Celts originated in central Europe (e.g., La Tene etc). This is a controversial topic, but apparently the original 19th century idea came from a misunderstanding of some classic period writings, which in turn were based on a misunderstanding of European geography. The linguistic and genetic evidence supposedly does not support the idea, and the archeological evidence is self-fulfulling because the finds at La Tene etc. became defined as the Celtic style based on the 19th century assumption that people in that area were Celts. The more recent theory is that Celts originated right where Ceasar encountered them much later...in Southern France (and in Northern Spain, hence the 'Celtiberian' mix). Oppenheimer's thesis is also that ancient Britain was not as Celtic as we thought - rather the areas roughly corresponding to England were originally more 'Belgian' in composition (mainly germanic), even before the Anglo-saxon influx, whereas the true Celts settled the areas that are still associated with Celtic culture today. If he is right, this does not invalidate any of the hard archeology in the previous thread, but it might force us to reconsider what we call 'Celtic' and 'Germanic' from the ancient world. With regard to The Origins of the British A Genetic Detective Story by Stephen Oppenheimer, I have not read this book but I looked over a number of reviews. "The common language referred to by Tacitus was probably not Celtic, but was similar to that spoken by the Belgae, who may have been a Germanic people, as implied by Caesar. In other words, a Germanic-type language could already have been indigenous to England at the time of the Roman invasion. " This is an unbeliebably dotty idea that ignores a vast body of evidence -- inscribed Pre Roman conquest Celtic coins from Britain and Gaul -- all of which are in Celtic. Not only that, but there is no difference between British Celtic and Continental Celtic: both are Brythonic. Basque is a surviving remnant of an pre- Indo-European language (as is Finnnish), It has nothing to do with Celtic or Germanic which are both of Indo-European desent. Spain was invaded by a group or groups of Celtic speaking people in the late Hallstatt. They were contained by the local populations and never spread much further and their influence waned (There is very little of the La Tene style in Spain). The Belgae claimed descend from German tribes, spoke Celtic and were part of the three divisions of Gaul as reported by Caesar . They were noted for their warlike nature and played an important part in the resistance to the Romans during the Gallic war. Some of the later south-eastern British tribes were Belgae, but not such tribes as the Dobunni in the south west -- although they did follow some Belgic influences in their coins. The Parisii -- which gave their name to Paris, inhabited that part of France as well as part of Yorkshire in England were part of the Celtae rather than the Belgae. Hi there! I am hoping someone can help me with the identity of this La Tene III sword owned by a friend of mine in Switzerland? Here is the link to the photos of it. She is a real beauty! Thanks to anyone who can offer an idea. Can't help in the identification. Do you know if it's been published in archeological reports? If not, the only way to identify it is to track down the previous owners, until you get to the finder. Other then that, there is hoping that it got published, and you can track down the publication and see if you can match the sword. I don't know which books you have to look for, but perhaps someone else here might be able to help. B.t.w. this is the best preserved La Tene sword I've ever seen! By the looks of it, it still has most of the original surface preserved including the surface decoration! The "cross-guard" is strange though, I've never seen them flat like that. The straight guard plates are pretty common on La Tene III swords. It has always kind of been thought that we start seeing them after the roman conquest in areas, but that just isn't the case. There seems to have been a major change to them before that. The double fullered blades usually have the ogee curved plates, but there are a few of them out there with straight. Lenticular blades have both styles, but straight is most common for the other blade styles. There are at least two of the cocked hat style of guards that have been found on continental La Tene III blades now and really I'm expecting any time now to find an example of the crown hilts there as well. The latest stuff that Nate sent me on Alesia is showing most of the La Tene III blades as having a pattern welded core down the center, but I haven't had a chance to start translating the text to see what specifics they have to say about it. They show it on both double fullered and lenticular blades though. Hi all! I posted the link to the La Tene sword but I thought I would trow this out for any advice/info. 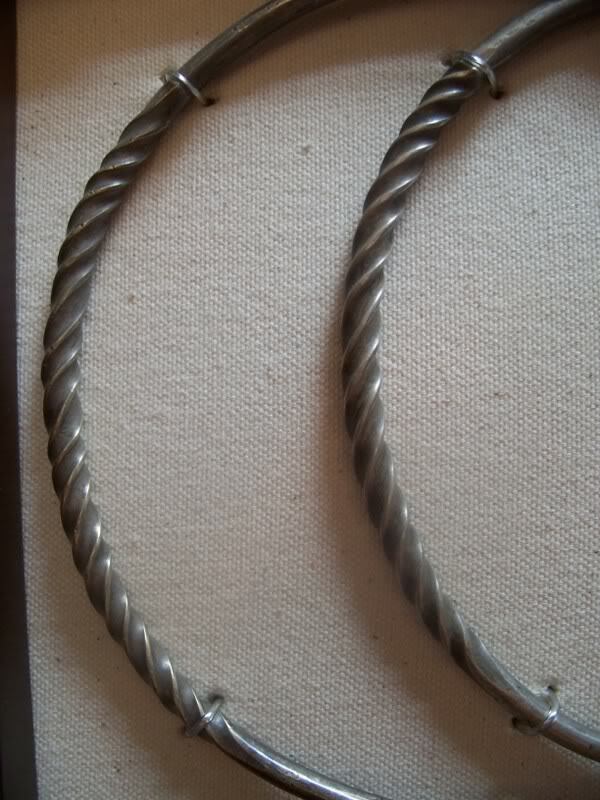 I own a pair of silver British torcs discovered at a dig in 1976 at St. Albans outside of London. It was in a large collection until liquidated last year and I bought two torcs from over twenty that were from the same large buried jar. Any ideas on the style or history of them? Here are the photo links. 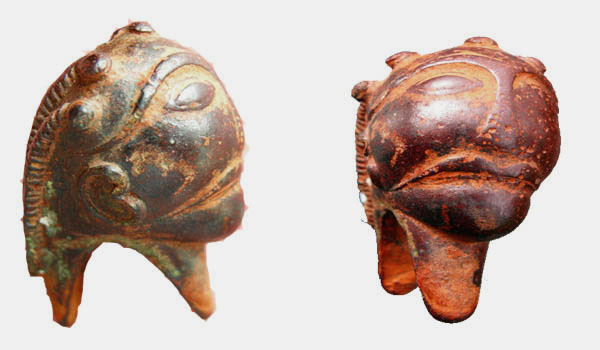 The features of this pommel remind me of African sculpture, especially the features and hairstyle. 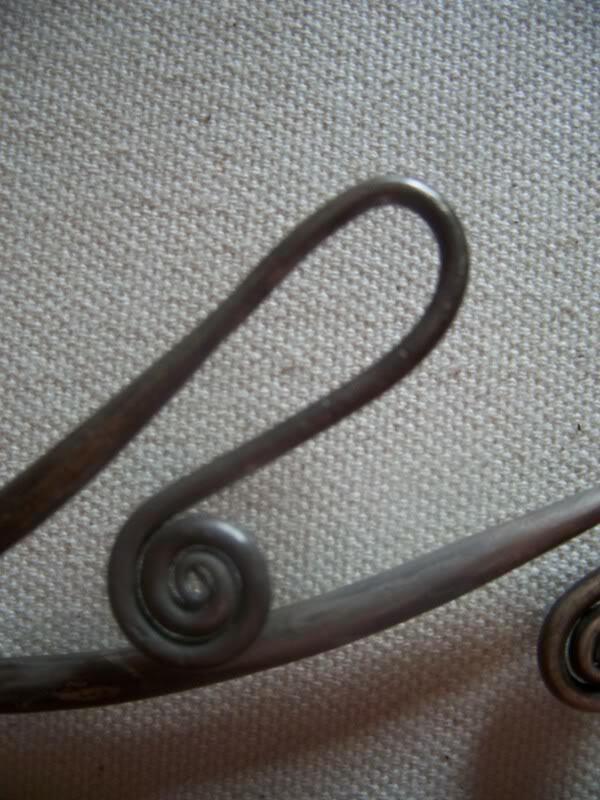 Twisted bronze torques are common at the end of the bronze age/early iron age (see some examples here: http://1501bc.com/page/Geheim_van_de_Kelten/05260641.jpg). The spiral endings I've not seen before though, at least not in western torques. Thanks for sharing that, I agree with Jeroen, that is the best preserved sword I've seen from that era. It just needs a new handle and a sharpening, and it would be battle ready. The handle Mr Spencer posted (Celtic Sword found at Bescheild Teir Germany) is one of the best preserved handles I've seen. Thank you, gentlemen, for this facinating and educational thread.